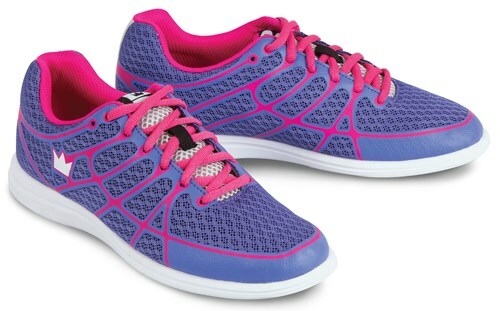 The fun, bright, athletic styled Brunswick Womens Aura bowling shoes are made with breathable mesh uppers and lightweight rubber outsoles that provide flexibility and movability. The Brunswick Pure slide microfiber slide soles offer immediate superior slide. These features combine to give you the bowling shoe performance you need while looking good! Hi Kat. Universal soles will have slide soles on both shoes. Hello Greg! Unfortunately, this shoe is only available in regular B width and the smallest size for this shoe will be a size 6. If you are needing the size 4, you will need to look into childrens shoes/youth size shoes. Hi! The Brunswick Womens Aura will be a B width. Unfortunately, these will be a standard B width for women. You can either use a sliding stone on the bottom of the shoes or sliding powder to help with the slide. Due to the time it takes to produce the Brunswick Womens Aura Purple/Pink ball it will ship in immediately. We cannot ship this ball outside the United States.